I've a Yamaha Grizzly ATV that I use as a snow plow at my residence. 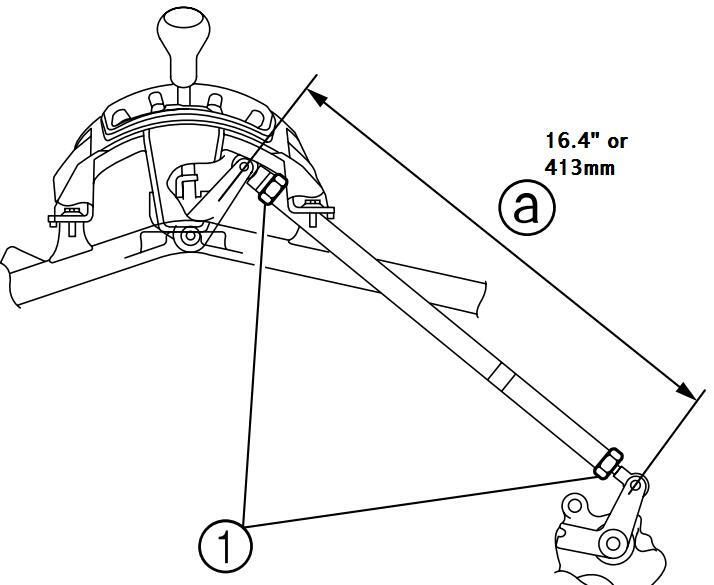 I'm having problems with the gear shift linkage loosening at the bottom mount in the picture below allowing the connection fitting over the rounded elongated attachment point to ride up over the attachment and then no further shifting until I get it back to the garage. What Loctite product would be correct for this application? I want a variation that will hold the nut from backing off, but don't want it to be so permanent as to negate further work down the road. Miller 251, Lincoln PrecisionTig 275, Miller DialArc 250 AC/DC, Hypertherm 900, Bridgeport J-head, Jet 14" lathe, South Bend 9" lathe, Hossfeld bender with a collection of dies driving me to the poorhouse, Logan shaper, Ellis 3000 bandsaw, Royersford drill press and a Victor Journeyman O/A. I have never encountered this issue, just basic adjustments that were not done proper at the factory but I will look in to it. What year and model is it? I can't see a thread lock being needed here, something else must be wrong. If all else fails the blue 242 stuff is what you want. Clean all surfaces well with acetone or lacquer thinner. Hold up on that though until I get back to you. Mike, I was explaining the position without looking at the photo as it wasn't up yet. It is the pivot for the "L" shaped bracket. Held on by I believe a cap screw that backs off most probably to either the frequent forward/reverse shifting on the drive or by vibration from the plow hitting curbs, concrete joints, etc. not sure of the age 5-6 years and it is a Yamaha 660 Grizzly. Photo below shows a similar round elongated attachment that rides on the male version that only projects a maximum 0f 3/32"-1/8". Doudle D is the term... If I follow you. Cause is usually a combination of several less than adequit design features. tending to loosen the nut/bolt that is supposed to secure said lever. 2, tollerence on the female threads in such assemblies is rather loose. works the screw sidewise and it looses up. 3, the double-D shape in the lever is by now, likely on it's way to Oval shaped. or hammer it back to a good fit. cause-ing bulges that will fit fimly as the bolt seats. Even permanent LocTite can be loosened with a burst of heat on the bolt head. to affix the bolt-flange to the lever, It won't loosen now. One hit with a grinder cuts the weld when you want it back appart. Last edited by vicegrip; 01-09-2014, 02:22 AM. Thanks Mike and Phil. The male and female double D mounts are still both in better than decent shape. While the ATV is something on the order of at least seven years old it reads less than 50 miles on the odometer...strictly a short drive snowplow. While the deformation of threads might work well Phil, I'm going to go with Loctite instead. Might look into drilling and safety wiring the bolt head to the lever (already a small flange bolt there)...the problem is from repeated shifting back and forth from forward to reverse...and the shifter does indeed **** the rod in and out of detents. Last edited by Wyoming; 01-09-2014, 02:26 AM. We'll be expecting at lease one good thread per month about the Choo Choos. Either commentary on curant RR events. The oldies but goodies from the 70's. Last edited by vicegrip; 01-09-2014, 10:14 AM. A lot of my stuff is held together with RusTite. D@mn am I slow some mornings! I was just about ta google RusTite. Now I swallowed my Coffee sideways dangitt! At least ya' swallowed Phil. Could have given your keyboard a nice sepia coating. Phil, not sure I've ever seen -45 out on the track, but I have endured -100 with wind chill while working the Logan helpers. More than once had to fire up fusees to get the air hoses flexible enough to couple. As to the once monthly RR/train updates...give me a poke now and again and I'll see what I can do for you. It is not a unheard of problem. I guess I would use any loctite I had on hand and I can't see it hurting to use the use heat to remove stuff either. It is not like it takes that much. But again I would consider other components near the nut. Slapped it together with Loctite. See how it does this time around. I have lived outdoors at -30f ambient for weeks at a time. The location is noted as the worst weather in North America. 231 mph highest wind speed recorded. I don't think I saw above 100mph wind speed but I sure would have liked to. Last edited by mikecwik; 01-10-2014, 09:45 PM. I broke thru thin ice a few times. Long long walk back thru the woods. Buddy was screaming he was gonna DIE !! all the way home.